I should point out that my process varies from piece to piece, but this is perhaps the most common method I fall back on. I've decided to use "Eirik's Fall" as the basis for this post. Luckily, I knew from the start that I wanted this piece to be laid out like a book cover since it would function as the cover illustration for my short story (details coming soon!). With that knowledge, I quickly sketched some thumbnails, keeping in mind the space needed for the text. Early on I never used thumbnails (and sometimes, if I have a clear image in mind, I still don't), but I wish I had understood there importance. In my experience, thumbnails can make the difference between a good composition and a great composition. 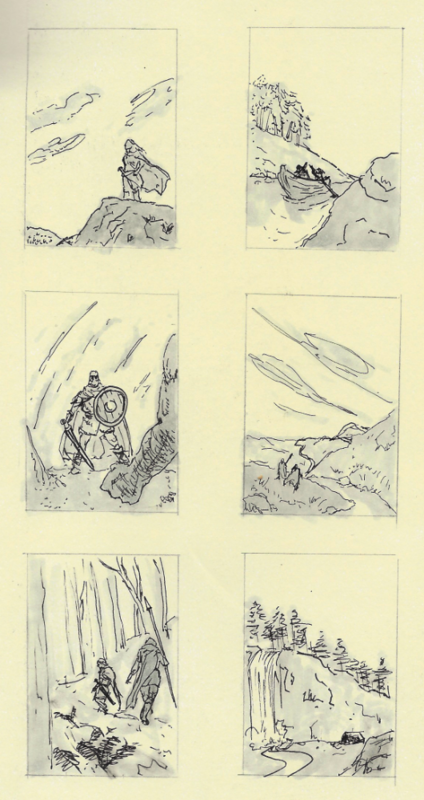 Here, I sketched out six quick thumbnail layouts in my moleskine, sparsely using a Copic marker for value. These were just exploratory sketches of different scenes within the story, and at this stage I didn't care at all about anatomy, accurate perspective, or color. Thumbnail sketches for "Eirik's Fall". I ended up choosing the top left thumb for the painting since it afforded a good space for the text and was still able to feature Eirik and the landscape (both equally important to the story). The next step was to gather reference and build a mood board. I didn't use Pinterest for this piece, but I've since found it quite useful for putting together reference and I highly recommend it. I had a pretty good idea of what I wanted my character to look like and the environment he was in, so I gathered anything that seemed relevant (chainmail shirts, fur cloaks, Scottish waterfalls, etc.). I spent a couple of hours on this stage alone. Mood and reference board for "Eirik's Fall". You could start with a value comp before this stage (laying out how your dark, mid, and light tones would be arranged), but I jumped straight to color comps since my thumbnail provided enough information on value. I played around with an overcast day to bring in a darker mood, but decided to stick to the story and left it bright. I spent at least 3 hours on 3–4 different comps, which would help me tremendously in later steps. Color comps for "Eirik's Fall". Equipped with my chosen thumbnail, reference, perspective grid, color comp, and mood board I went straight into the painting from scratch. I only use a limited amount of brushes (maybe a dozen), mostly because I hate having to dig through 200+ tiny brush icons. When I first started painting digitally back in 2010 I was obsessed with finding and experimenting with brushes, and while I don't think there's anything necessarily wrong with it, I've come to learn that a brush is simply a tool to aid you, not do the work for you. A work in progress shot of "Eirik's Fall". Rendering takes a long time, but I did my preparation and was able to move along pretty quickly considering. You can see where I deviated from the initial thumbnail, but I felt I needed to show more of the geographical features (specifically the waterfall), so I made an adjustment in the perspective and continued forward. I wish I had some more progress shots, but at the time I didn't think anyone would be interested in seeing them. I'll be sure to keep some steps from a future illustration if enough people are interested. If you have any questions, feel free to e-mail me or find me on Facebook and send me a message! If you're interested in finding out more about the story behind this piece, you can download the ebook (for Kindle or Epub) for free! If you like it, please consider sharing. Thanks again!